Thai rescue crews attend to passengers of a capsized tourist boat in rough seas at a port in Phuket on Thursday. A tourist boat carrying more than 100 people overturned in rough waters off southern Thailand on Thursday. Phuket Gov. Norraphat Plodthong said 51 people were rescued, while 53 others remained missing, according to The Phuket News. At least one person died. Strong winds continued to blow as rescue workers searched for survivors in the Andaman Sea off the popular island destination of Phuket, the newspaper reports. But by late evening, crews had suspended the search with plans to resume at 6:30 a.m. local time Friday. The boat was carrying mostly Chinese tourists, according to The Associated Press. The Phoenix wasn't the only vessel in the area to capsize during Thursday's stormy weather. 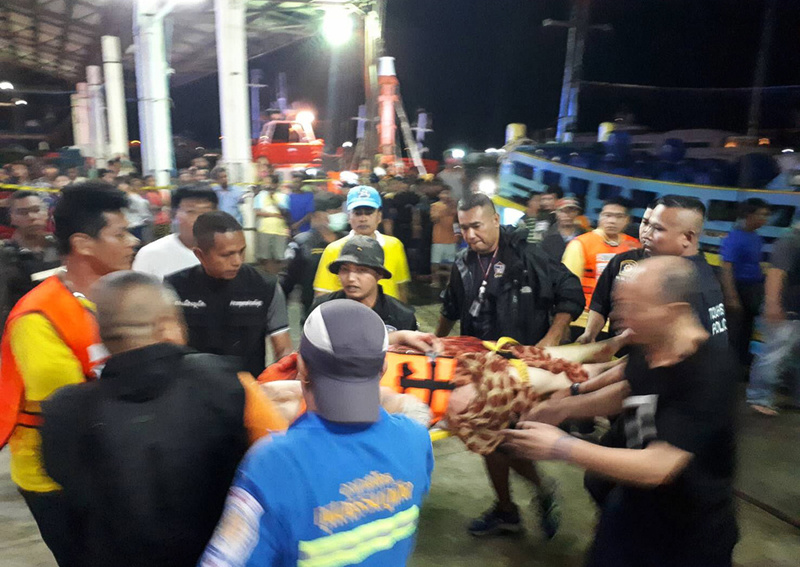 The Phuket News says another boat sank southeast of Phuket; officials said all 39 people aboard the Senalika were rescued. As a precaution, the governor reportedly ordered all boats not to leave port overnight. Meanwhile, off the coast of Indonesia, more than 30 people were confirmed dead after a ferry sank Tuesday near Selayar Island, according to local officials. Video footage of the disaster showed passengers in orange life vests clinging to the side of the sinking ship, as others fell into the water. After the ship began to take on water, the captain steered it close to the island and then crashed it in the shallows in a bid to save lives, according to media reports. CNN reported that "as the boat began taking on water, the captain of the ship steered the vessel toward the nearby Selayar Island, and deliberately crashed it in the shallows to save as many lives as possible, according to Sutopo Purwo Nugroho, spokesman for Indonesia's disaster management agency." The broadcaster said 155 people managed to swim to safety or were pulled from the water. When it sank, the boat was overcapacity, with cars, trucks and buses jammed on board at the time, CNN said. Also Tuesday, Indonesian officials called off the search for three people presumed drowned in another ferry sinking. That boat was carrying 164 people when it went down on June 18 in a volcanic crater lake on the island of Sumatra, AP reports. More than 30 people died.